The CPU heat sink used in the MediaSmart Server is custom designed with a special hole pattern that does not allow it to be replaced with commercially available parts. It is also a passive design, relying on air movement from the two 80mm server case fans to provide cooling. In practice this works fairly well, though the enthusiasts have always wanted to increase the cooling performance particularly when upgrading to a more powerful (and thus hotter) processor. Long time forum member “Eidos” has just shared with us his prototype design that replaces the existing heat sink and adds a small cooling fan. His initial testing shows a performance improvement though it does add to the noise level of the Server. Here’s what Eidos has to say about his efforts. I use AS5 CPU thermal paste and I am now in the burn in phase in the first day. The heat sink is at least as good as the original and seems to run generally 5 to 10 degrees C cooler than the HP original one. Yes it is noisier but my goal was to run cooler. Please remeber I had to use jungle shop mechanics to make this so it is not pretty but it works. A real design would have the fins on the heat sink being higher and also running the other way but I wanted to see the possibilities. 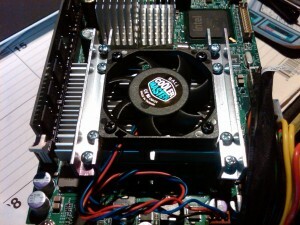 I powered the fan using the fan power terminals on the motherboard. I will keep you advised of the final results. You can check out his full writeup with more pictures and ask any questions in this forum topic. Thank you, Eidos, for sharing your work with us!